Ed and Lisa Hinker of Sturgis, South Dakota, are Mustang enthusiasts—and that’s putting it lightly. They’ve owned countless Mustangs (many of them of the Saleen variety) and number Steve Saleen among their personal friends. 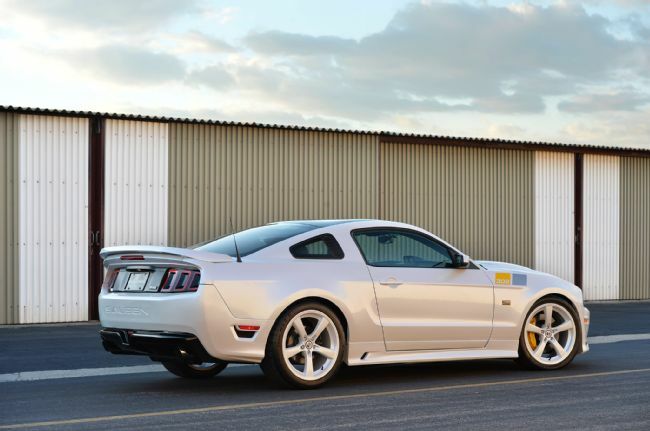 That said, the 2014 Saleen SA-30 Mustang seen here wasn’t even a blip on Ed’s radar when he began talking to Steve about building him a unique Mustang. It wasn’t just any car that he had his heart set on. Ed wanted his car to feature throwback cues like the rear seat delete with exposed spare tire. They also discussed painting the finished product gray. After the ideas were set in motion, Ed tells us that they ran into more than one hiccup. 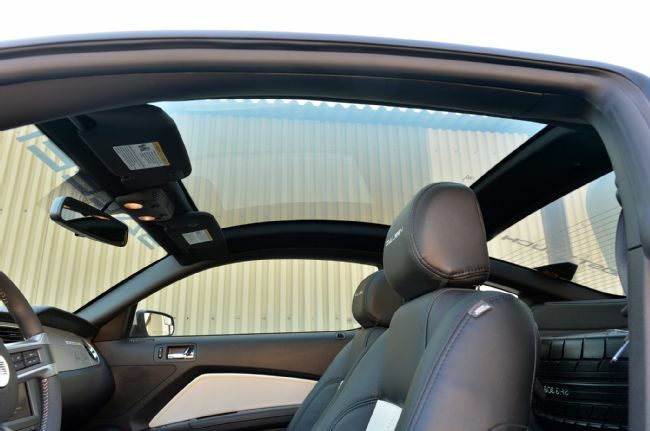 A full glass roof was planned with “frost touch”, but the glass kept wrinkling in production. The final product took about a year to build and was planned to debut at the Mustang’s 50th Anniversary celebration in Charlotte, North Carolina, in April 2014. Not long before then, Ed got a call from Steve Saleen. Ed was surprised but not at all put off by the news. It came to be that Steve had rolled Ed’s ideas into the production of his Saleen SA-30 vehicles, which celebrated 30 years of Saleen and its racing heritage. 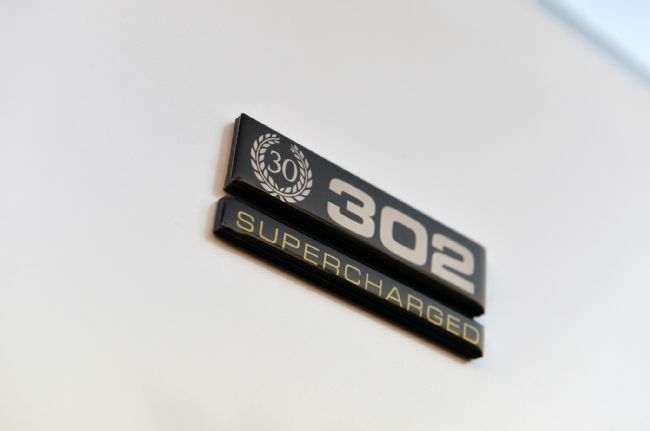 You see, only 30 Saleen SA-30 vehicles were produced: 10 each of the Saleen 620 Camaro, the 570 Challenger, and of course the 302 Mustang. According to Ed, this particular SA-30 is unique in that it was the first one produced and the only one equipped with a rear seat delete and frost touch glass roof. When Ed saw the car for the first time, he loved it, but he thought something was missing. “He took it back with him from Charlotte to add yellow piping on the seats to bring the exterior styling inside,” says Ed. Each SA-30 Mustang is equipped with a stock 302 with forged internals and a compression ratio of 10:1. A Saleen intake sits atop the 302 with a 88mm throttle-body. 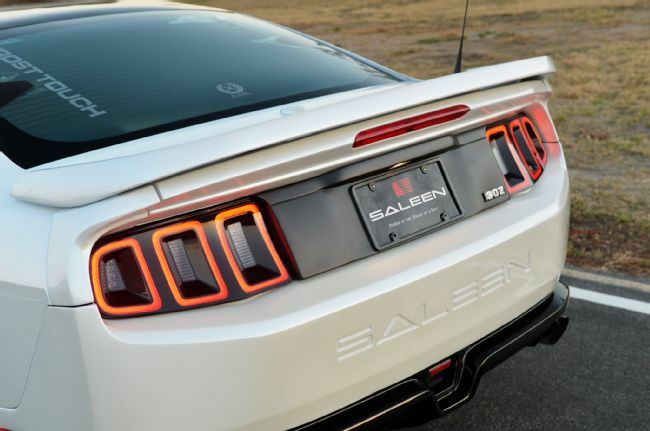 Saleen high-performance headers with 3-inch pipes carry exhaust away from the engine. 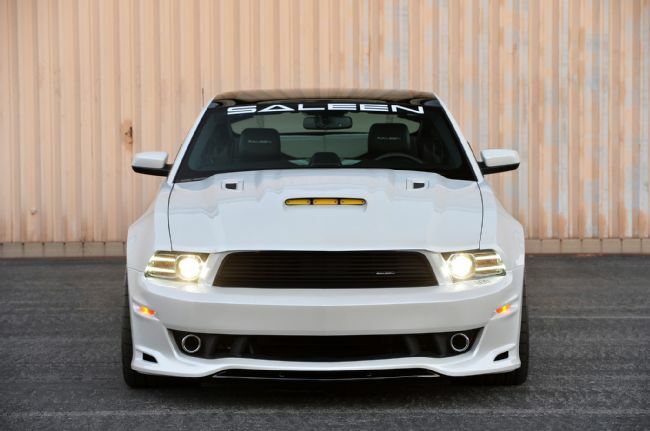 Of course, a Saleen wouldn’t be complete without a supercharger. A Saleen Twin-Screw liquid-cooled supercharger producing 15 maximum pounds of boost powers the SA-30 to a cool 675 hp and 560 lb-ft of torque. Ed told us his Mustang has run a best quarter-mile time of 11.2 seconds at 121 mph. A TR3650 six-speed transmission allows Ed to slam gears whenever the craving arises. 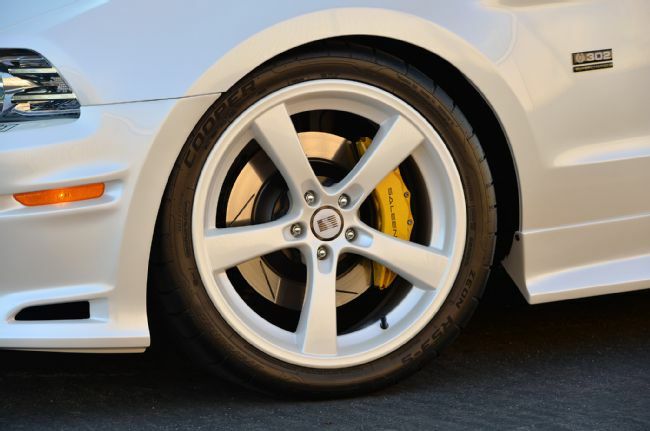 A full Saleen S4 suspension keeps the Cooper tires glued to the ground in the corners. The striking Tire Smoke Pearl White paint offset by yellow and gray accents sets the SA-30 apart. 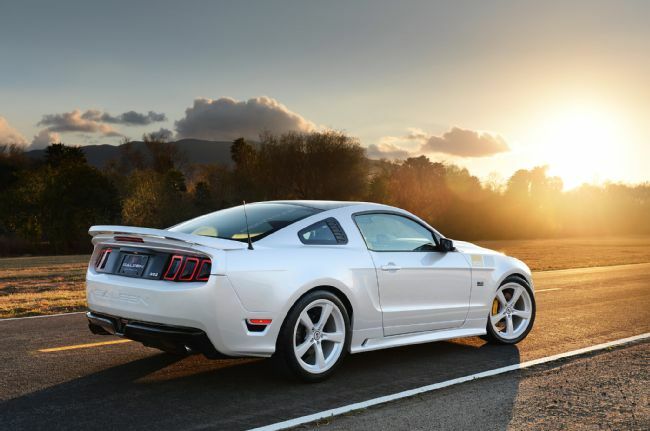 The Saleen five-spoke forged wheels are color-matched to the body—a stunning detail. Body modifications include Saleen aerodynamic body parts: a downforce wing, a butterfly induction hood, and ground effects. 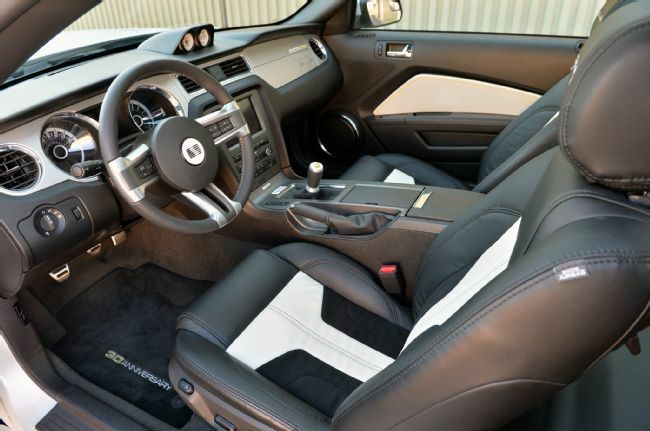 Going back to the interior that Steve had rebooted for Ed, leather and alcantara two-tone performance seating with yellow piping really pops with the aforementioned rear seat delete (with exposed forged color-matched spare), Saleen billet aluminum brace, and frost touch glass roof. Ed does venture out to the Sturgis Mustang Rally each year with a specimen from his collection—a show he convinced Steve to experience as well. Ed is one of the organizers of the huge show, which drew around 1,000 Mustangs last year and takes place during Labor Day weekend each year. And you just never know what incredible vehicle Ed will show up with next! I was able to see this car first hand last year at the Sturgis Rally - it is quite impressive and the color is incredibly beautiful. I would second that, saw the car at Carisle last year. Spoke with Ed for a little bit on the car. Very nice guy to meet. Great looking car! Ed and Lisa are two great people! Your main issue might be, there may have only been three of the announced ten produced. So, slim pickings. May you send me the details of #9 offline? I would like to compare the build spec to the other known cars. Thanks. #9 SA-30 is being auctioned next Thursday, March 15th. Last edited by ManheimPAAutoAuction; 03-09-2018 at 10:44 AM.